SAN FRANCISCO--(BUSINESS WIRE)--RSA Conference, the world’s leading information security conferences and expositions, has named BigID “RSAC Most Innovative Startup 2018.” A judging panel comprised of venture capitalists, entrepreneurs and industry veterans selected BigID from a group of 10 finalists and announced the winner at RSA Conference 2018. 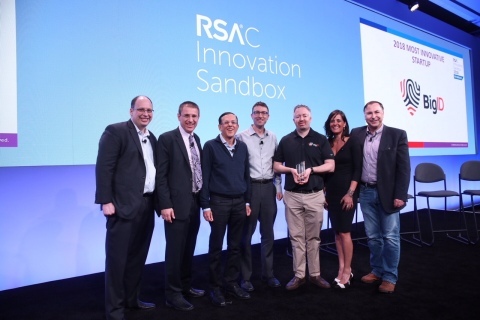 In its thirteenth year, the RSAC Innovation Sandbox Contest is a leading platform for entrepreneurial cyber security companies to launch their ground-breaking research and innovation. This year, the RSAC Innovation Sandbox Contest team is working exclusively with leading business information destination, Crunchbase. This media partnership supports the Conference’s goal to advance the cyber security industry forward by shining a light on groundbreaking security companies. Using data supplied by Crunchbase, RSAC calculates that in the past five years alone, the contest’s top 10 finalists have collectively seen 15 acquisitions and have received more than $1.25 billion in investments. Past winners include successful security veterans Phantom, Waratek, Red Owl Analytics and UnifyID. For a more complete picture of where past RSAC Innovation Sandbox participants stand today, visit the RSAC Innovation Sandbox Leaderboard for updated status and funding totals. BigID is a US-Israeli software company focused on privacy and personal data protection. As enterprises stare down GDPR and similar privacy regulations, they face new challenges in understanding what personal data they collect and process. BigID is redefining how enterprises satisfy GDPR and meet new data privacy and protection requirements. Fortanix was recognized as well by judges for Runtime Encryption.